First of all, I would like to make it clear that I am not entirely sold out to industrialization. I still believe that the Philippines’ major key to global competitiveness is our major strength--- agriculture. The only reason why our country has been working overtime sending love signals to foreign investors is because a former president once believed that we needed a facelift so we could look like other industrial nations and compete with them in the global arena where the losers go home with the ultimate consolation prize--- the chance to become first class toxic waste dumping sites. Aside from that president who MAY have had noble intentions, some other government officials offer their legs wide open to investors because of the scent or stench of green paper bearing the faces of noble people who are now dead and cannot protest that their images are being used for global pimping. It would be wrong though to completely shun industrialization. No country can survive without some measure of industrialization. I know I can’t survive without it. I don’t have a green thumb because the color is concentrated in some other area in my body and animals freak out at the mere sight of me. That means I cannot survive planting camote and raising hogs. The only work I can do is the kind performed in an industrial office. This year, thousands of workers like me were given the chance to get decent industrial jobs when Korean company Hanjin Heavy Industries began construction on the $2 billion shipyard in Tagoloan and Villanueva. The complex would have covered 441.8 hectares of land and would have been the 4th biggest shipyard in the world. It would have offered 40,000-45,000 jobs and would have contributed P4.6 billion every year in salaries and wages alone. Why am I using “would have”? Make a guess. I dare you. This piece of news should’ve sent skilled workers and office bound souls singing Hallelujah and jumping like jumping beans. Just last week though, there have been reports that the construction machines have grown silent. There is even some speculation that Korean travel bags and suitcases are well on their way to Korea with their owners. This is where the story gets nasty and murky. This is where the plot thickens and becomes the stuff telenovelas are made of. It seems that the project has been indefinitely shelved. Depending on which horse’s mouth you are listening to, the nominees for the reasons behind the project cancellation are: Hanjin’s lack of environmental and building permits, NPC billing problems, lack of PEZA permit, landownership issues, the mauling of a Hanjin employee and resident relocation problems. Hanjin director Myung Goo Kwan summarizes everything by simply citing “negative publicity” and “numerous adversities”. Those phrases are alternatively spelled “politics” and “bureaucracy”. Those of us who have been living in this corner of the world know better. We know that public statements are often sugar coated, glazed or caramelized! Statements that are made public are just the tip of a ship-sinking iceberg and that deeper, darker, smellier secrets lie below clean-looking water. Being the promising scoundrel that I am, my underworld minions who populate dark dens at night have brought me bits and pieces of the hidden bottom of the iceberg. Since I cannot afford to be sued for libel, I cannot reveal the speculative stories surrounding the Hanjin fiasco. Let’s just say that the media and the politicians are not mentioning everything they know about missing cash, substandard relocation sites, red-faced locals barking up the wrong tree, conversations under government tables and an an enraged madam who took to spanking her dogs for letting go of a bone in pursuit of a bigger phantom bone (see Aesop’s fables). As of this article’s writing, some PETS (acronym for petty sycophants) are under investigation. Officials from high above are also said to be in a mad scramble looking for ways to kiss Korean feet, or some other body parts, without appearing to do so and without appearing to insult Korean principles. If the officials fail at fawning, the people of Misamis Oriental will be left with nothing but a gaping hole in time and space where 45,000 workers should’ve been working for food on their tables. I’m on the edge of my seat. I wonder if the next episode will be “Return of the Investors” or “Penitent Pets”. Nice blog.. The site txtmate.comsends free sms in the Philippines. Find your soulmate. ‘Yup, I believe!! !’ The nasty behind the cancellation (kadyot) of this 2B dollars Korean investment to the Philippines ( Tagoloan-Villaneuva ) is the bulk of ninoy aquino and these three gents of the 1t bill - (P400M). 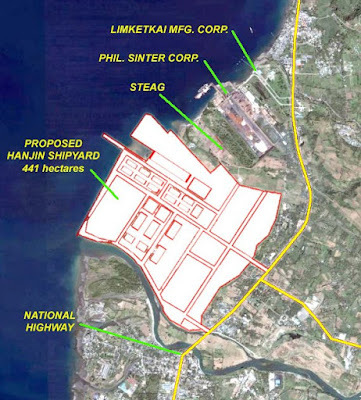 Local officials said that their (Hanjin) requirements are not complete (referring to the ECC)… I don’t think so!... Sana wala, dahil nakahihiya talaga sa atin – mga C_ _ _ _ _ _!!! Shame on them! This is really one of the reasons why our country won’t grow. when will our government officials change their way of serving the people. when will their hearts tell that bayan muna bago sarili. hahaha. grabe yan ha. di pa ako familiar sa consolacion-bonbon bridge. grabe naman yan ano? yup, what's in your mind is really true (bridge). kung ang politiko marunong, graft charges are far from him. that's the reality if you are tin the position. kung ang whistle blower against government corrupt officials can't be protected, it's better for them to join the club... di ba? wala rin naman talagang nagawa ang telenovela sa senado (i'm reffering to lozada. imagin baya you're beating the great wall of china... mahihap 'yon! advice nalang sa mga whistle blower, sumakay nalang kayo sa panahon at yayaman pa kayo! hehehe. good afternoon grace! They said, under the Arrovo i mean Arroyo administration nothing can hold the its chairs anymore because she braces the four corners of our society. That's why if you look at the Spanish meaning of ARROVO it is a theft-actual stealing... If you remember that this was accidentally mispelled written in a P1000 bill. It actually written as Gloria Macapagal-Arrovo. hahaha. ganun pala ang meaning ng arrovo? hahaha. how very fitting naman ng mistake na yon. i hope alam ni gloria yung meaning nun. I found and tried this free unlimited sms to all network website. You can send unlimited texts to all Philippine subscribers. We can also meet new friends and txtmates through discussion and chat.